In my last post, I talked about the fact that a lot of what we think of as relaxing (watching TV, browsing pinterest, checking facebook, etc) isn’t really as relaxing as we think it is. Since most of us use computers, smartphone, tablets, and TVs every day, and since technology is an inevitable part of our modern world, it’s important for introverts and highly sensitive people to learn how to use these devices in a way that won’t leave us feeling overwhelmed. 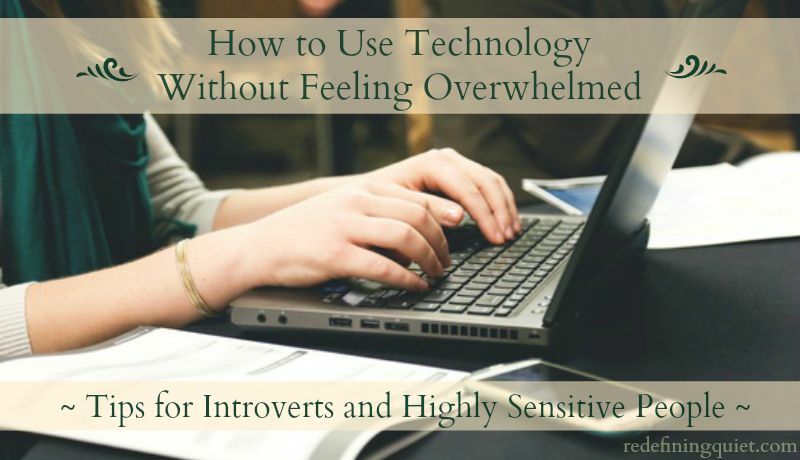 While it’s important for extroverts and non-highly sensitive people to manage their technology use wisely, too, it’s especially important for introverts and highly sensitive people because we are more easily affected by subtler forms of stimulation and because we reach the point of overwhelm much sooner. These are some of my favorite ways to use technology without feeling overwhelmed, and, even though each of these are just small changes, they can make a big difference in the way that technology use affects us. This is one thing that I have a hard time doing but that really helps me. A lot of times I find myself going back and forth from one screen to the next. Whether it’s my computer or my phone or the TV screen, spending too much time absorbed in technology usually leaves me feeling drained, frazzled, and overwhelmed. What works much better for me is to take breaks from using technology and do other things I enjoy that don’t involve a screen. This is especially important for me anytime I’m already feeling overstimulated and overwhelmed from a busy day. Right after I leave work, for example, rather than checking my phone or sitting down at my computer, I feel much better if I take my dog for a walk outside first. Being out in the fresh air and surrounded by nature gives me a nice little break that dials down the level of overstimulation enough that I can work on my computer without feeling even more overwhelmed than I already am. This is a subtle thing that I don’t always even notice at first, but the more browser tabs I have open on my computer, the more frazzled I start to feel. I think the main problem (besides the fact that they slow down my computer so much that I’m about to go crazy with frustration) is the fact that having that many pages open feeds into my procrastination habit. There are so many possible distractions for me to click on that I usually end up jumping from one thing to the next and never really focusing on any one thing. This is a bad enough habit during leisure time because it’s very draining for introverts and HSPs to have that much of an information overload at one time. It’s an even worse habit, though, if I’m trying to get work done on my computer because I end up procrastinating and spending a lot more time on facebook and pinterest than I do actually getting something accomplished and then I feel like I wasted my time and didn’t get anything done. This goes along with keeping browser tabs to a minimum. It can be pretty overwhelming to open up your email inbox and see 2,374 unread messages. I’m pretty bad about this one and my inbox usually ends up getting cluttered with obsolete emails that don’t even need anymore. Do I really need to keep reminders from two years ago that my library books are due back? Probably not. It’s a small thing, but taking care of emails as they come (or at least setting aside a time each week to go through them) can help to keep your inbox a bit less cluttered and avoid the chance of an important email getting lost in all of the junk mail that you never got around to deleting. If you’re like me and you tend to keep staring at the screen until your eyes start to go blurry, it can be really helpful to install an app that will remind you to take a break every so often. I have one installed on my computed called Workrave, and I have it set to remind me to take a 30-second break to look away from the screen every 10 minutes and a 5-minute break to get up and walk around every hour. I have to admit that the reminders can get pretty annoying when I’m in the middle of something, and there are many times when I completely ignore them and press the “skip” button. (I may or may not have just skipped a break a minute ago because I wanted to keep writing . . .) Overall, though, I take a lot more breaks with the app installed than I ever did without it. If you really need to get something done, there’s nothing more distracting that seeing a notification pop up about a new facebook message or comment. Especially when I have a lot of browser tabs open, I find myself being distracted by seeing the little numbers in parenthesis pop up on the tab. And if I’m trying to concentrate on something, hearing the little “ding” of a new notification never fails to draw my attention away from what I’m doing. Any time I want to focus and stop myself from procrastinating, logging off of facebook and pinterest helps me to be so much more productive since I’m not constantly jumping from one thing to the next. Now that I’ve finally joined the modern world and got a smartphone, I realize how overwhelming the constant barrage of notifications can be. Back when I had an old flip phone, I would see the occasional notification of a new text message or phone call, but with my smartphone, I couldn’t even look at it to check the time without seeing a message about a new email or facebook comment or pinterest re-pin. And seeing those flashing icons on the screen was like having someone demand that I stop what I was doing and check the new message. Right now. The easiest way to get a break from this overwhelming amount of new information is just to turn the phone off, of course. But since most of us need to leave our phones on so people can reach us if necessary, a more convenient way to reduce this overwhelm is just to turn off the notifications for email and social media and then have designated times during the day to check those sites rather than constantly having your attention drawn away by them. 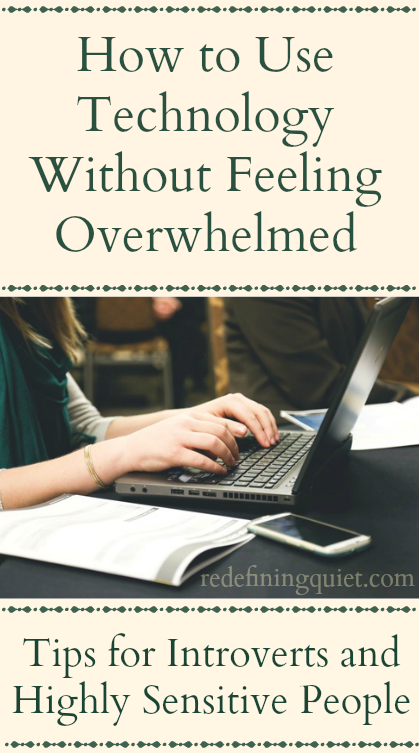 This is something I don’t always notice until I’ve already reached the point of overwhelm. I really enjoy listening to music, but I’ve noticed that I can only listen to certain types of music while I’m using any kind of technology at the same time. Louder music or music with lyrics is usually too much extra sensory stimulation if I’m trying to read something on my computer or reply to an email or something like that. When I’m using any kind of technology, especially if I need to focus on what I’m doing, I need to listen to quieter music or instrumental music. Everyone reacts differently to different types of music, but it helps to pay attention to how you feel and to see if certain types of music make you feel calm or more frazzled. Most of the time, I would rather read a book than watch TV, but when I do watch TV, I’ve noticed that certain types of shows have more of a negative effect on me than others. Sometimes, even though watching TV is supposed to be a relaxing activity, it has the opposite effect and makes me feel tense and unsettled rather than relaxed. Any type of reality competition show, for example, usually makes me feel stressed, especially if the contestants are racing against a time limit or end up running into disasters that ruin whatever they were working on. I hardly ever watch the news because most of the stories are upsetting and negative, and any TV show that has a lot of violence is too disturbing for me to watch. The exceptions for me are really good movies or TV shows that are dramas since they have characters and setting and plots that make them seem more like reading a novel. The aesthetic combination of story line, scenery, and background music are redeeming qualities that make it more like the experience of reading a book or watching a play. I think this one is probably the most important of all. I recently came across this post – 5 Daily Habits that Will Change Your Life – and it was a really good reminder to me of how important it is to start and end the day in a calm, relaxed way. Just like the post described, I had gotten into the habit of reaching for my phone first thing in the morning and checking my email and facebook, even though my eyes were still too blurry to really focus enough to read anything anyways. Instead of the “quick check” I had planned on, I would end up getting pulled in by those social media sites and having to rush to finish getting ready on time. And the same goes for those last few minutes before going to bed, too. My excuse is always that I’m setting my alarm for the next morning, but then I inevitably end up spending far longer than I had planned on my phone, and staying up much later than I should. Not to mention the fact that all of that extra information fills my mind with more things to think about and process before falling asleep. And my introverted, HSP mind is plenty full enough as it is anyways! Since the first part of the morning after we wake up sets the tone for the rest of the day, and since the last part of the evening affects how well we are able to unwind before going to bed, avoiding the extra stimulation and information overload of using technology can make all the difference in how we feel during the day and how well we are able to rest at night. PAID ENDORSEMENT DISCLOSURE: In order for me to support my blogging activities, I may receive monetary compensation or other types of remuneration for my endorsement, recommendation, testimonial and/or link to any products or services from this blog. 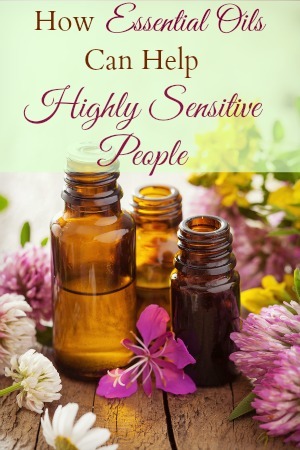 I only post links to products, though, that I love and feel good about recommending to you. ← Are You Really Relaxing as Much as You Think You Are? 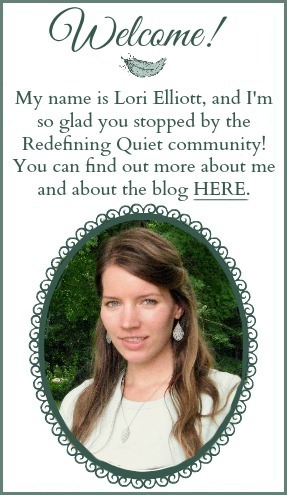 Visit Redefining Quiet's profile on Pinterest.